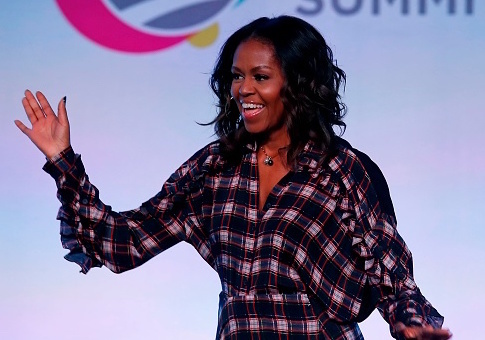 The Food and Drug Administration is continuing several Obama administration agenda items, helping to cement Michelle Obama's anti-obesity legacy. The FDA is overseeing the implementation of several Obama era healthy eating initiatives. The far-reaching Obamacare regulation mandating calorie counts on menus went into effect on Monday. The FDA is also moving forward with a new Nutrition Facts label designed by the former first lady and Obama administration sodium reduction targets. The calorie labeling rule is opposed by pizza chains and grocery stores that say the rule is overbroad and carries criminal penalties for "misbranding" food. The rule, which left confusion as to what a menu is, was delayed numerous times under the Obama administration and again last year just days before it was set to go into effect. FDA commissioner Scott Gottlieb, however, has made it clear the government will continue several nutrition policies of the Obama administration, saying last week that it is the government's role to help Americans "make better choices about our diets." Gottlieb said the calorie rule, which can carry criminal penalties, features a 171-word definition of menu, and may or may not apply to beer, is "pro market and pro consumer." "Over the past year we've worked hard to make sure this new rule can be implemented in a way where the information will be maximally beneficial to consumers and the new requirements will be minimally burdensome to restaurants and retail establishments," Gottlieb said in a blog post last week. Gottlieb said through the rule, the government can nudge Americans into eating what amounts to about one less cookie a day. "Studies show that menu labeling can make an important difference in every day food choices that add up over time," he said. "Recent research shows that smart menu labeling reduces the average number of calories ordered by 30 to 50 calories per visit." "That may sound like a small amount," Gottlieb added. "It comes out to less than a cookie a day. But over a year, based on that sort of reduction, you could end up consuming 10,000 to 20,000 fewer calories, making you three to five pounds slimmer." In addition to the Obamacare calorie mandate, the Trump administration is also pushing forward with Michelle Obama's crusade, a new Nutrition Facts label, which features calorie counts in a larger font and emphasizes added sugars that some nutrition scientists say lacks "scientific rigor." Gottlieb praised Mrs. Obama's label, saying, "Consumers will soon have access to an updated food label that's based on current science." "It provides more easily understandable information to help Americans to build healthy, home-cooked menus when they're shopping in grocery stores," Gottlieb said. Changing the way Americans grocery shop was a hallmark of the Obama administration, as it pondered talking shopping carts, and Mrs. Obama offered tips on how to make a shopping list. "FDA has also not been shy about locking in other major pieces of the previous administration’s nutrition agenda," Politico reported this spring, and has "plowed ahead in trying to get Americans to eat healthier." Voluntary sodium reduction targets introduced by the Obama administration, but fiercely opposed by salt makers, are also being carried forward under Gottlieb's leadership. Other agencies in the Trump administration have rebuffed Mrs. Obama's nutrition policies. One of the first acts of the new Department of Agriculture was to "Make School Meals Great Again" by relaxing the first lady's school lunch rules and giving kids more salt in their lunches. Kids had created black markets for salt in lunchrooms due to unpalatable choices under the healthy eating standards. Though the FDA recommendations to reduce sodium are voluntary, they will "put considerable pressure on food companies to cut back on salt over time." While Gottlieb says there is "no single more effective public health action" than reducing sodium, there is much debate over whether salt is good or bad within the scientific and nutritionist communities. Government nutrition advice has been vastly influential on American diets and turned out to be wrong in the past. This entry was posted in Politics and tagged FDA, Michelle Obama. Bookmark the permalink.